Take it from a friend who knows: "travel is not scary or difficult for the mature single woman. Confidence and planning are the keys." Rome, Chicago, London, Vienna, Berlin . . . best-selling author and entrepreneur Jayne Seagrave has traveled there, and she's done it solo. With this guidebook, she has compiled information, tips, and tricks to share with mature women interested in seeing the world. 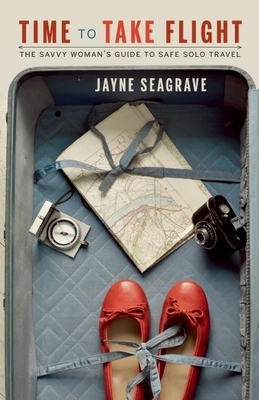 Like a world-traveled, well-informed friend, Seagrave provides encouragement, advice and support for the safest, and most comfortable sojourns, and offers practical guidance based on her first-hand knowledge of the locations she recommends. She shares tips for researching, booking, and packing for your vacation, includes checklists to follow when preparing to leave, and even discusses insurance, jet lag, traveling through menopause, and financial considerations. Seagrave also recommends twenty-three popular locales throughout Europe and North America, and suggests what to do upon arrival (how best to get from the airport to your hotel), where to book your accommodation (and which areas to avoid), activities for your stay, and additional tidbits of information and personal anecdotes she's learned along the way. For the mature woman looking to travel safely, comfortably, and solo, Time to Take Flight is the ultimate guide. Born in the UK, Jayne Seagrave immigrated to Canada in the late 1980s. She is author of Camping British Columbia and Yukon, which has sold more than 40,000 copies, and more recently Camping with Kids in the West. She has traveled solo all over the world as the marketing manager of a home improvement business she owns and operates with her husband. She divides her time between writing, working, and speaking (jayneseagrave.com).